Today I did a lesson with 6th grade called Linear Graphs: Life-Sized Coordinate Pairs that I found on the Teaching Channel. Definitely go there and watch the video. It explains it in great detail! 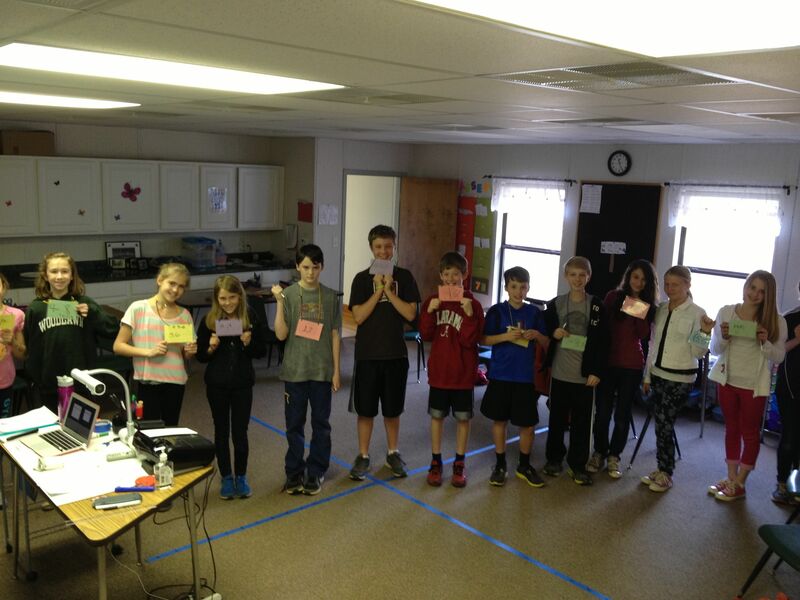 To do Life Sized Human Graphing put a giant coordinate graph on the floor and then give the kids a rule. They must come up with an ordered pair that fits the rule and then go and stand on their ordered pair. I taped a coordinate plane on the floor with painters tape. I also had each student wear a dry-erase necklace to write the ordered pair on so everyone could see their ordered pair. They kept saying, “Does my ordered pair work?” I kept saying, “Go graph yourself and see!”. The class stayed engaged the entire time, and were even “overly engaged” arguing about the math at points. I love that. After the first few examples I let them ALL come up and get in line instead of just four or five. I did this mostly because they begged me. They couldn’t wait to get up and see if their point fell on the line! I used Max’s “noticings” in this as well. They first noticed that they were all in a line. Then they noticed that the line was steeper when it was 2x or 3x. They noticed that 2x made the y-value go up by 2, 3x by 3, and so on. The connections that were made today were amazing and I hope that they carry over tomorrow when I introduce slope (aka rate of change)! I also made a powerpoint so that the game would be easy to manage. Just click to follow the link and download the file from the Math Wiki. After we start graphing linear equations I want to try Graphing Full Body Style! This entry was posted in Activities, Graphing by I Speak Math. Bookmark the permalink. Since I introduce the concept of integers to my 6th graders, I do something along this line. I tape out the room into the 4 quadrants, give them each a half a deck of cards. They turn over one card of their partial deck on cue and the rule is: if it is a red card, it is negative, black, it is positive, even number, go to the upper quad, odd number, go to the lower quad. They must then find a partner in their quadrant and create their ordered pair. We then check (they self-regulate a lot) to see if everyone is correct before we turn over the next cards. I’m looking for a modification to this so they don’t get too locked into the wrong idea that even numbers are always in Quadrants I & II, and odds are always in III & IV. Any suggestions? Can you change the rule sometimes and say evens go in quadrant 3 + 4 and odds go to quadrant 1 + 2? Or use the suits (hearts = q1, diamonds = q2 etc) rather than odds and evens. This looks great. 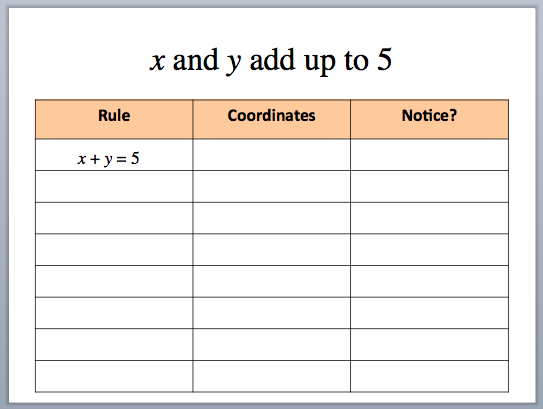 I will definitely give this a go when we next do some graphing and coordinates. Thanks for the idea!